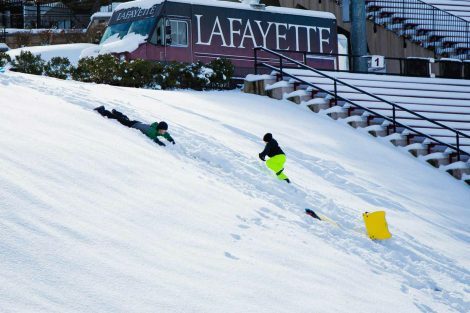 On the eve of the 154th edition of the most-played college football rivalry, Lafayette’s facilities operations team was running defense—against Mother Nature. 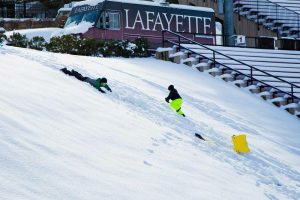 An early-season winter storm dumped more snow than expected on the Lehigh Valley yesterday, creating massive traffic delays, power outages, and general havoc throughout the region. Clearing roads, parking lots, and pathways is standard operating procedure for facilities operations throughout the winter months, of course. But clearing an entire football stadium to make it game-day ready is a whole other task. Fisher Stadium, host to tomorrow’s Lafayette-Lehigh football game, was buried under more than 8 inches of dense, wet snow. Facilities crews were out working until midnight Thursday. 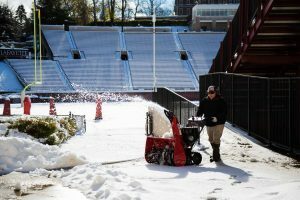 Despite the College’s delayed Friday opening, they then returned to campus at 6 a.m. to resume the cleanup, knowing the 100-yard task that lay ahead. 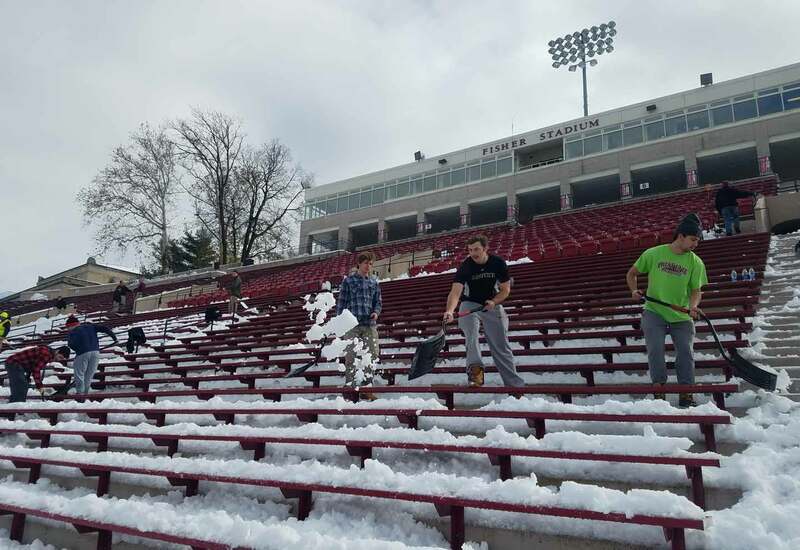 Many students pitched in, working throughout the afternoon to dig out the stadium. Watching the scene, this became clear: Everyone is all in to #BeatLehigh. The storm was reported to be the second-biggest one-day snow event during the month of November in the Lehigh Valley. 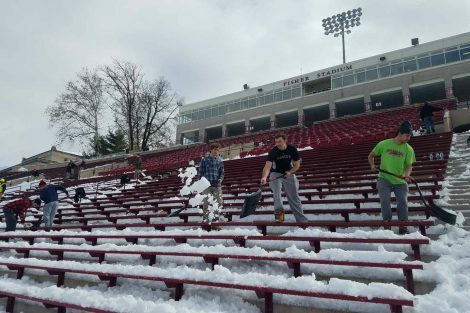 Students, including members of the men’s lacrosse team, volunteered to come down to the stadium and help facilities crews shovel out the grandstands. 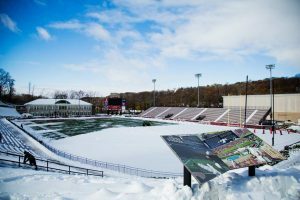 “I think it’s 8.2 inches, but it sure feels like more,” says Bruce Ferretti, executive director of facilities, who was out shoveling the home grandstands Friday morning. 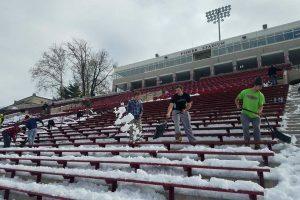 While the Lafayette-Lehigh game is the centerpiece of Rivalry Week, it is only one of several events facilities crews were actively preparing for. Friday evening, The Maroon Club hosted its Hall of Fame induction dinner and Chicago Cubs Manager Joe Maddon ‘76 hosted a trivia night for students. 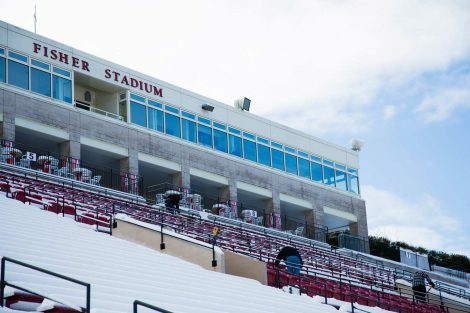 When I saw this article, I thought about the summer of 1975 when, before starting my senior year, I stayed in Easton (after finishing my work as a summer orientation counselor) and snagged a job for the rest of the summer working for the College’s facilities department until the fall semester started. One of the many assignments we had was replacing the bench seating at the stadium. I had a great time that summer and worked with an eclectic group of guys including a full-time facilities employee nicknamed Tiny and a couple of high schoolers from Easton. I really enjoyed being part of that group. Good times, good memories, and we got a lot of work done that was needed. It gave me an understanding of the day-to-day work, much of it behind the scenes, that goes into keeping the College running smoothly. I’m positive those seats we replaced have been replaced again (probably more than once). That summer was part of my move toward “adulting” and I treasure the memories as part of the great times I associate with being a Leopard! Thanks for the article and for the fond thoughts!